Unless you're a regular to international trade shows, the opportunity to speak to the major players within well-known overseas guitar companies are few and far between. However, when we visited PMT in Birmingham to experience the ESP Beach Party held there on June 5th, we were very happy to meet and chat with Jose Ferro, whose accommodating demeanour and effervescence allowed us to peek into part of ESP's inner sanctum. So Jose, what are your day-to-day duties? (Laughs) "Well, I'm executive VP at ESP guitars and my duties pretty much entail sales worldwide. I take care of all the international distributors and oversee my sales team that deals with the domestic market including the independent dealers and major chain stores. "I'm also involved in coming up with designs for some of the guitars, doing all the production, ordering with the factories and also negotiating with the pricing domestically and worldwide. That's pretty much my whole job!" How do signature models come into being? For example, could you talk us through the genesis of the Truckster, one of Metallica-man James Hetfield's models? 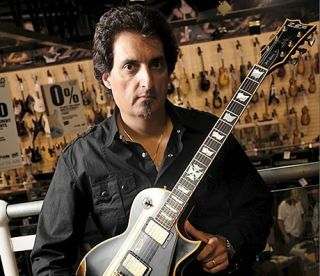 "The president of ESP Guitars, Matt Masciandaro who's been with ESP for 25 years, has had a relationship with Metallica since pretty much day one, and he's responsible for the Truckster. "It was one of these things that he was talking to James Hetfield, and James is very much in to race cars, and that finish came from that. If you look at it it's kinda primer paint and Matt developed that with him. Then early last year (2009) Matt had the idea for the black Truckster. He just made that on a whim and took it to one of their shows for James, and he loved it. "An existing band might come to us with an idea, so we'll sit down with them and listen to the idea, because the phrase with ESP is that if you can dream, we can build it. If the idea sounds kinda hokey, we'll tell them but we do have a great relationship with the artists that we have and that's what's really important. They'll listen to what we have to say but we'll listen to them too: if they're representing us we should support them in every way possible. "The way that we look at it is that it's got to be a two-way street. Yes, we want to have and support the great players but it's got to help us in return, give us some exposure and presence, when playing the guitars live. "Most of the time these bands will come to us rather than us approaching them. Once in a while we've gone out to go and get someone, and one guy who fell into our lap was Alexi Laiho. About ten years ago at the [Frankfurt] Messe show, I noticed that about 90% of the people who were at the public day were wearing Children of Bodom shirts and I was like 'Who is this?'. So I grabbed some kids and asked them who the band was, and they told me about Alexi. It kinda fell into my lap because our distributor in Finland, Musamaailma, had a relationship with him since he'd been a child. So a call was made to lead him in the direction of ESP, he hooked up with ESP Japan and that was that. Do you get involved with the Custom Shop? "I am involved to a certain extent. Matt and Jason Gile will handle a lot of the domestic (US) custom orders. There's a form on the website that you can fill out and send to us, and we'll direct them to a retail store who will go to ESP Japan, figure out what it is, get pricing and so on." What's ESP's stance on quality control? "We're pretty intense with quality control, not only with the ESP range but with the LTDs too. I come from a retail background - I used to work on 48th Street in New York during the eighties - and there was nothing more frustrating than selling a guitar to somebody and finding it in a poor condition. I'm not gonna mention any names but I would open the box and pray that the guitar would be in a playable condition. "So one of the things I said was that anything that leaves here (ESP) needs to be ready to go. We're very, very particular as far as the playability, cosmetics and everything else about the guitar is concerned. Y'know, if someone's spending a fair amount of money as something of an investment, we want them to be happy with the investment." Is there anything new in the ESP pipeline you could tell us about? "Well, we may be doing some acoustics, I'm still doing some research into that. There's something that Matt is working on too... I'll leave it at that but it's going to be pretty big. I'm keeping my fingers crossed!" What sort of music do you play for pleasure? "I'm a bass player and I've always been a fan of English rock; y'know, Led Zeppelin, Deep Purple, Uriah Heep...I could go on and on! When ESP came out with the vintage-style and distressed bass that we have (the Vintage-4), and one of our guitar techs said that he could put a mirror pickguard on it. I was like 'Do it!' and I love black - that whole Johnny Cash thing! - and I was such a fan of Phil Lynott, bless his soul, and Think Lizzy. I have, like 30 ESP basses, but that one's my baby!"